Tenor: 17½ cwt approx. 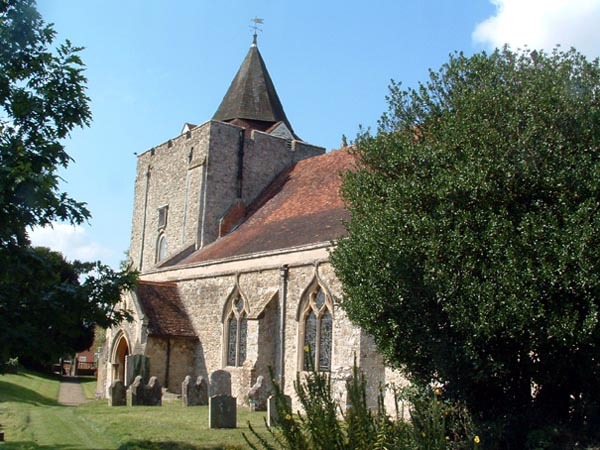 in E.
c 1000 A small church was built by the Anglo-Saxons. 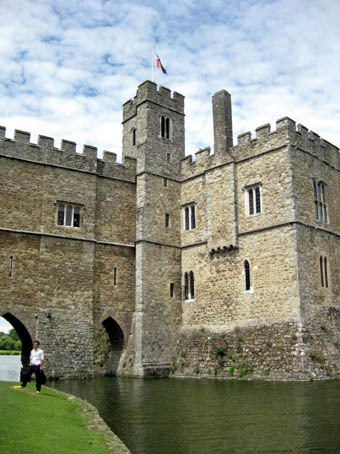 c 1200 The Normans added a tower and enlarged the church. 1540 By this time the original church building had been enlarged further and the Anglo-Saxon parts rebuilt. The Leeds Abbey on the south side of the church had been dissolved and no-longer controlled the activities of the church. There may have been bels at this time, although no record is known to exist. 1617 A Great Bell weighing about one ton was cast by Joseph Hatch and hung in the tower. 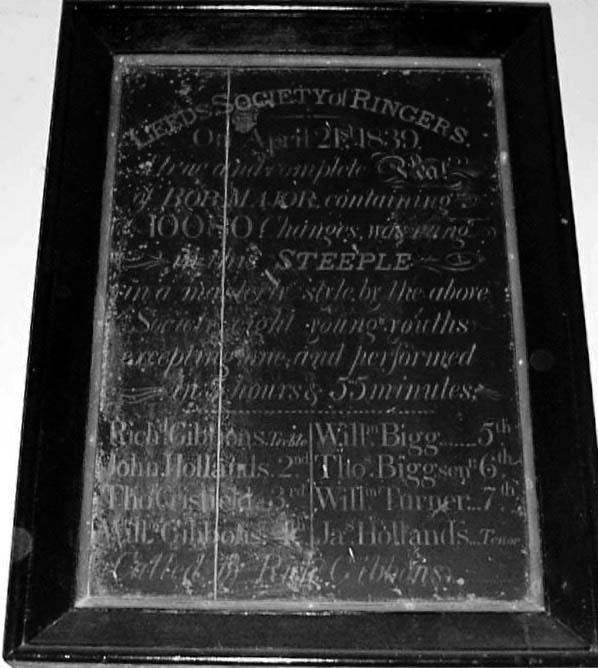 1638 John Wilnar cast 3 lighter bells, making them four. 1751 A major restoration of the church took place. 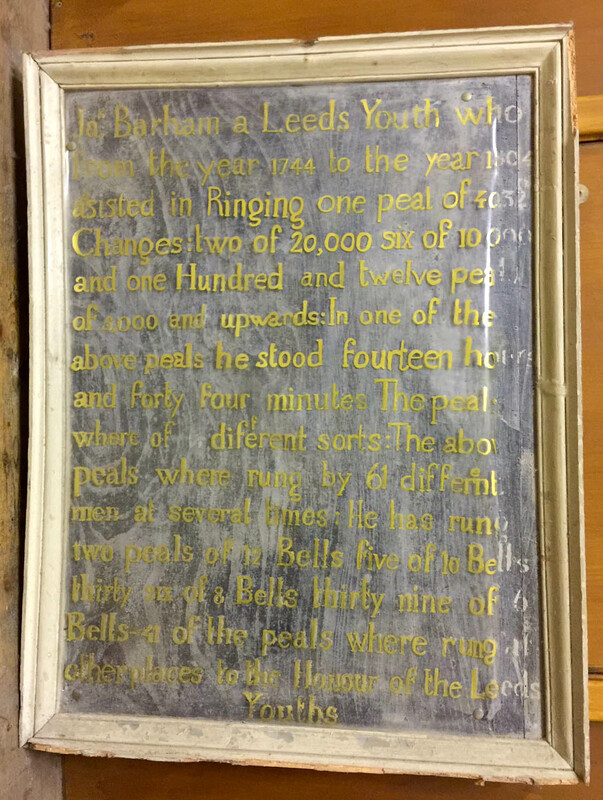 Henry Meredith of Leeds Abbey paid for a bell (the present 5th). 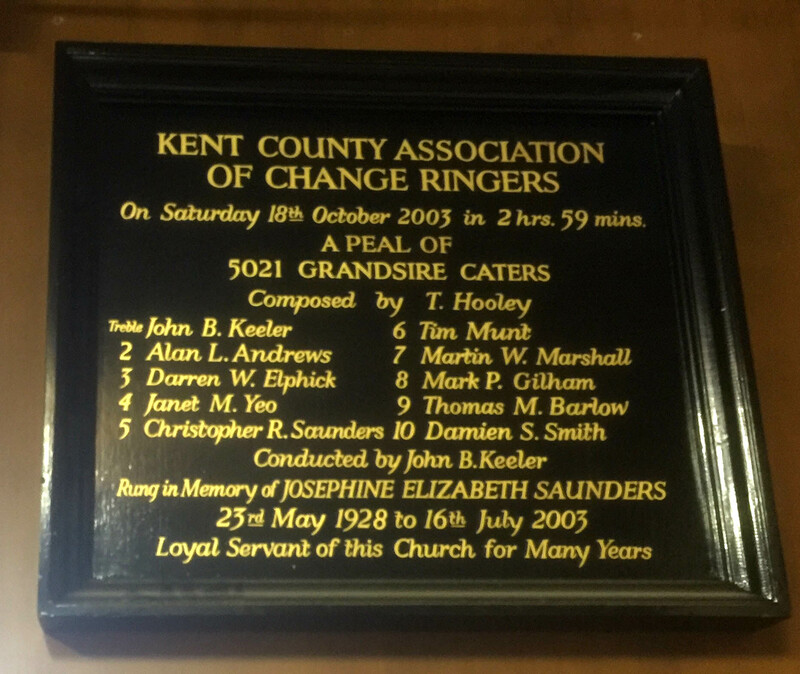 The present 6th was paid for by Churchwardens Robert Hatch (maybe a relation of Joseph and William Hatch) and William Woollett. 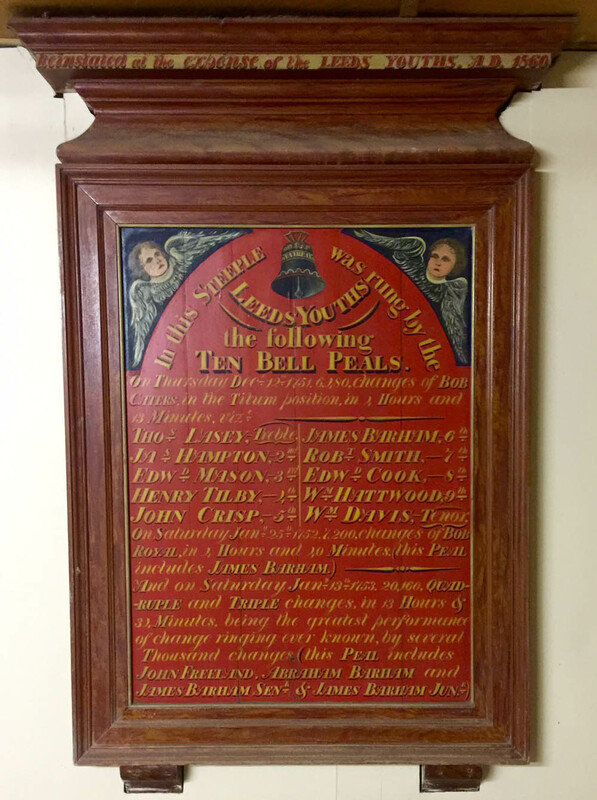 The lighter four bells were paid for by The Hon. 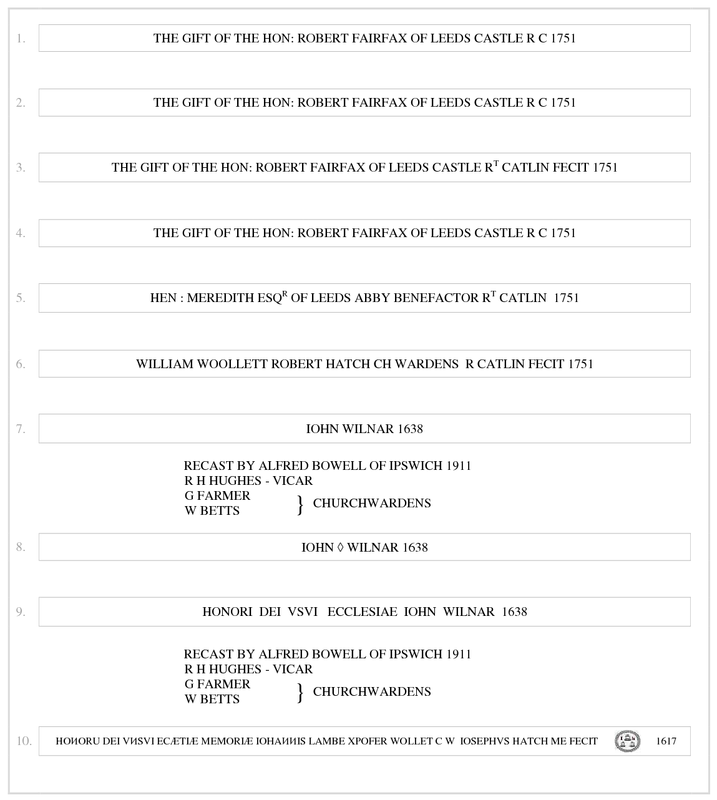 Robert Fairfax of Leeds castle. 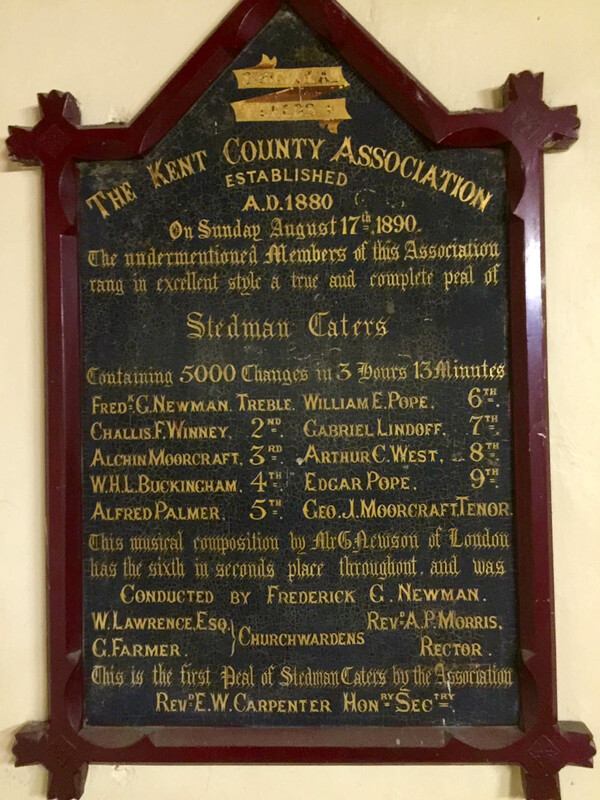 The order was placed with Robert Catlin of Holborn who hung the bells in a new frame. 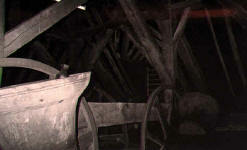 At the same time a wooden spire was erected which stood until 1932 when it became unsafe. 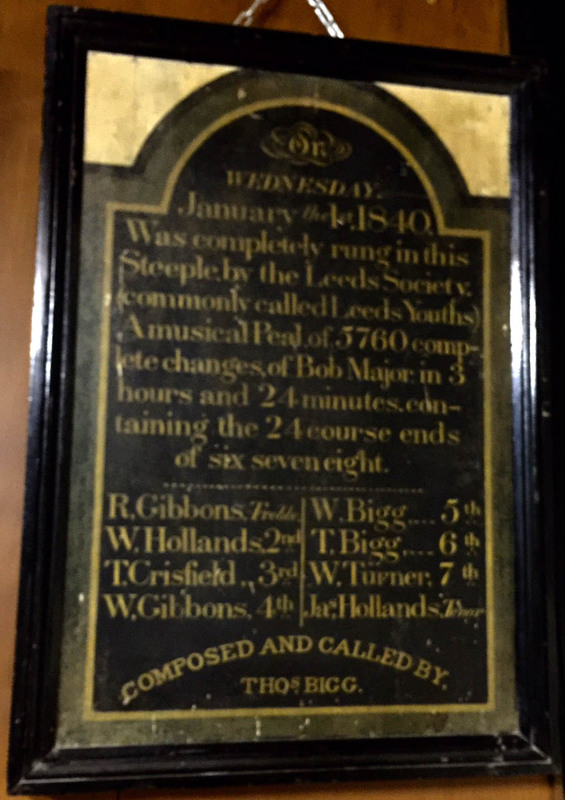 The celebrated "Leeds Youths" began ringing at the tower. 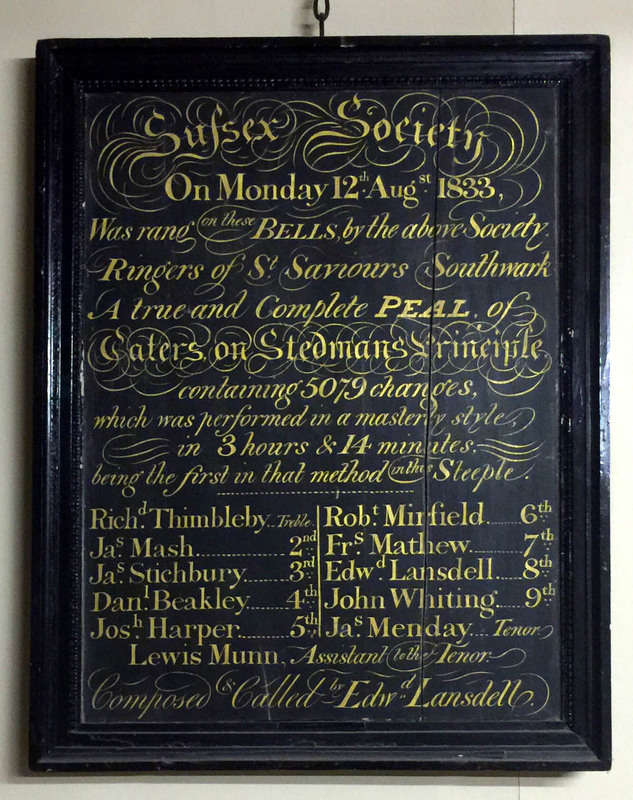 1898 Some bells were quarter turned and (unsatisfactorily) rehung. 1911 Alfred Bowell rehung the bells on new plain bearings. 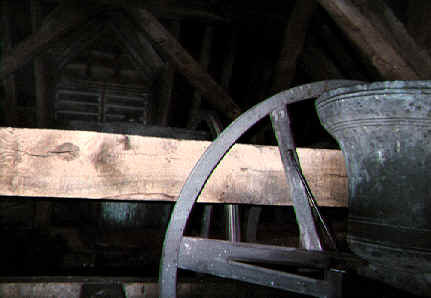 He also recast the 7th and 9th bells and cut the canons off the rest (except 1 and 2), fitting them on RSJ-type headstocks. The tenor was fitted with an independent clapper staple. Ellacombe apparatus was also fitted. 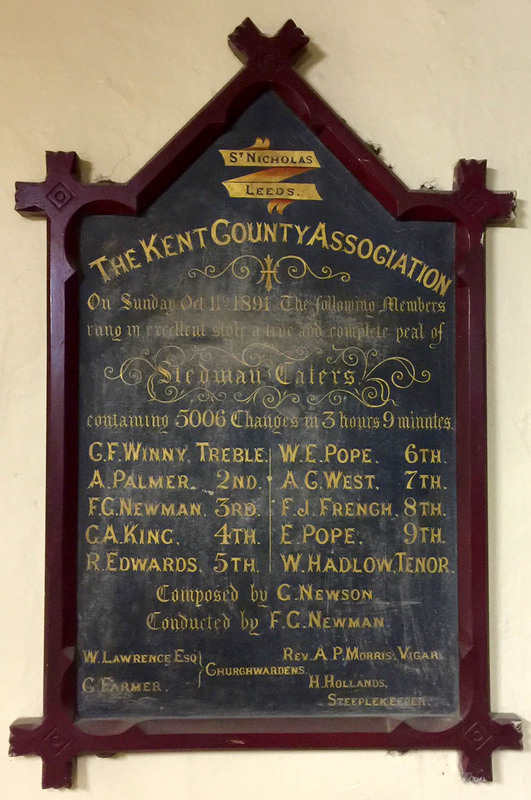 1956 Ringing resumed after prompt action against deathwatch beetle. 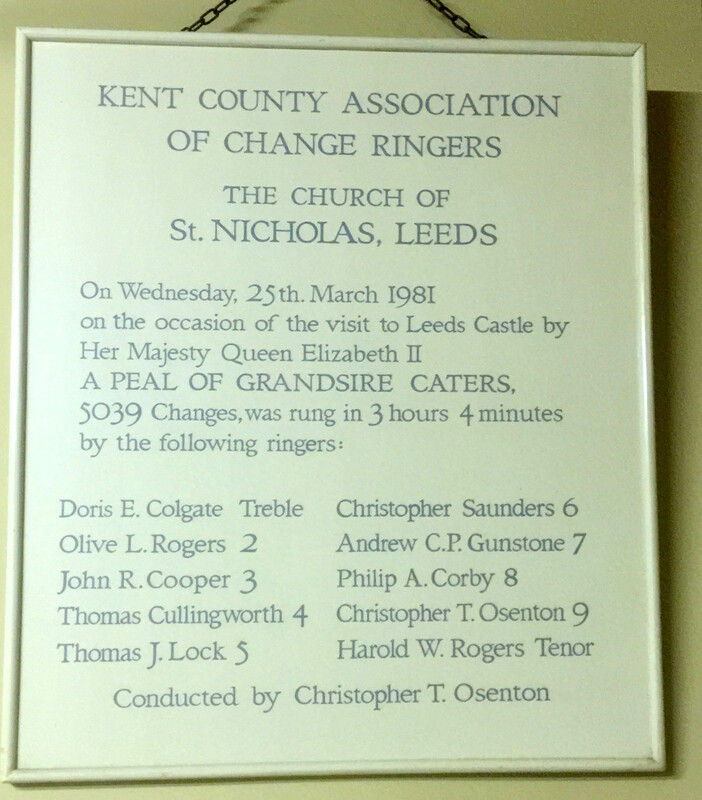 1963 The spire was replaced and the ringing room redecorated. 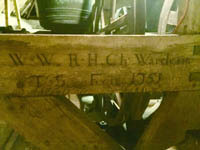 Carelessness with the redecoration resulted in the loss of much of the interesting writing on wooden panelling around the walls by ringers of the 19th Century. c 1985 During the 1980s, the space below the ringing room was converted into a kitchen and meeting room. 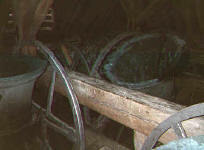 The Ellacombe Hammers were removed and an ugly heating system was installed in the ringing room. 2000 The Ellacombe Hammers were cleaned with the intention of replacing them. 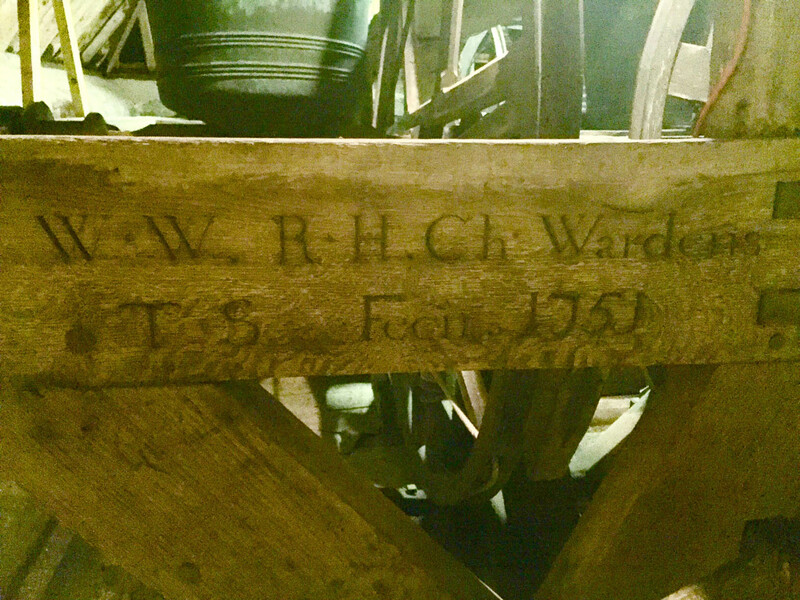 Inscription on the side of the frame showing the initials of the churchwardens and the frame builder, TS (who could well be Thomas Sweetlove).